I think it a nice car, but to small for me, just wait till I get a new truck. I add some kittyfication to a F-150. 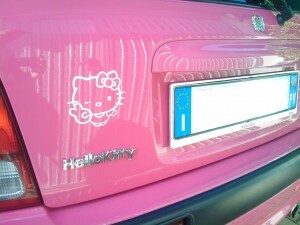 Any way I know on other male fan why has a Hello Kitty car and another male fan who is the planing stage. Sleep tight Mr. HKH were out there and on the road. SOOOOOOOOOOO CUUUUUTEE!!! hope to have one!! exactly as this…congrats debby!! This is every girl’s dream car! If I had this car, I would wake up every day with a huge smile on my face and everyone that saw the car would be so envious. The only person that wouldn’t want to be seen in this car is you and that is because you have no understanding of how much joy that Hello Kitty brings to everyone except you. Why would anyone want a boring car when you could brighten up everybody’s day with a Hello Kitty car? Personally my dream car is a pre-War MG TC, red with chrome spoke wheels. but hey, thats my personal thing, I’m only a GIRL. I don;t get why someone would want their everyday car to be so…hideous is the kindest word I can think of. I know you HK fanatics actually thinks it so sweet and cute, but believe me folks, it ain’t. its the car equivalent of Jar Jar Binks. I mean, why do this to a serviceable car? What has it done to deserve such humiliation? Nah, definitely not my dream car. I had a minivan when I was 16 and I have NO desire to go back. Too difficult to park and drive with. Hahaha, that is so funny! Look at all the pink fluff all over the dashboard! I love how on the website, the second to last photo has a Hello Kitty lying face down. id rather have a peridot green vw beetle. I own this car right now! The rest, I’d paint over it. I got enough pink in my room, thanks. Definitely not my dream car. how do you see the gauges with all the pink fake fur fluffy stuffs all over the dash????? Only a Sanrio executive could drive such an oversized TOY with a straight face. Aaaaaah Beetles, gotta be the original though, not th emiddle aged spread of the current BMW fed thing. About the only thing I may tolerate HK wise is the exhaust pipe, and thats only because I know the Evil Feline will then choke slowly to death on the noxious fumes. @Kitty, the “neue Beetle” is effectively a retro-styled VW Golf IV, not a Bayerishe Mist Wagon! come on…let the joy of your weed spread…don’t you want us to be happy ^_^? You’d have to shot me thirty-seven times to get me into that car. Thank you all! 🙂 Smack! I love Hello Kitty! But I would rather die then have a car like that…..totally crazy…. There is a Hello Kitty VW Beetle tooling around Kansas City, MO. Don’t have a photo of it yet. It’s cute, but a tad overdone. I wouldn’t mind using the car, although I’m sure my bf and other male acquaintances would rather shoot their own balls off then enter the car. Or maybe they’d HAVE to shoot their balls off in order to enter the car. Hmm. Why censor the license plate, though? How many cars have you seen that look like that? It’s not like identification is going to be difficult, with or without the license plate. Well, don’t worry about running into this car anytime soon unless you’re planning a trip to Europe. Notice the circle of stars (which stand for the European Union) and the big I on the plate? Yes, that is an Italian licence plate people. Anyhew, this car is yet another fine example of too much of everything. And the bunny that sits on Kitty’s head really pisses me off because it is clearly a complete ripoff of the fabulous (and very Dutch) “Nijntje”, known in English as Miffy (and no, don’t worry, I’m not a Nijntje fanatic). As a girl, my dream car involves a LOT of green, no hello kitties/fuzzy animals. I have censored the plate Blog or because some sites do not want to publish photos with the plaque. in some states the law on privacy is more severe than others. I got the new muffler / pipe. look at the photos on the site:) is beautiful. the site link is listed at the top in the comments of the webmaster. are Italian, I live near Milan to Pavia. Oooo ideas springing into mind for further jazzing up my own pink honda jazz. Hubby would most certainly not approve if I went this far. I’ve been explicitly forbidden from doing any more work to her. The HK seat covers, floor mats, steering weel cover and a couple of HK plush models are as far as his tolerance will stretch. He’s already removed about four of the HK models dotted on the dashboard and the HK sun protectors I put in the back for our son claiming he was not going to stand back and allow our child to be traumitised any further. cute car. but i would stick to a rear mirror doll and the exhausts. Look HOOOT on a Tiburon and sound hot too. 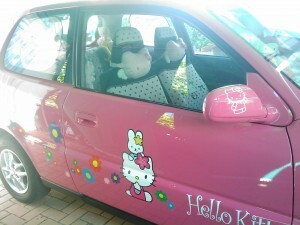 wow, this is so fab… love the color, but not the interior… but overall, this is a must have.. i love Hello Kitty.. I had to take my sister’s Hello Kitty’s Fiat 500 to the mechanic so picture a beard long haired guy driving a pink small car. I’m still having nightmares about that day. Its a cute….I LOVE HELLO KITTY…I have everything Hello Kitty. I just purchased a 99 Honda Civic, and its almost ready! Its all Hello Kitty. 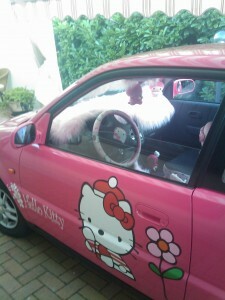 Again, you make me jealous by working a hello kitty in your car, how can you make that car look very cute, thanks for give an idea, I would to make my daughter happy by own this car. I like the white decals and the plastic replacement make letters. The rest is a little much for me.